Caleb had another appointment with the orthopedic surgeon today - a follow-up from the procedure last week. When the school left to go for their weekly swimming lesson he came and sat in my office to wait until it was time to go. It's a bit of a distraction having another person sitting in your office, even if they're sitting quietly on the floor and not asking questions. He's quite fun company. 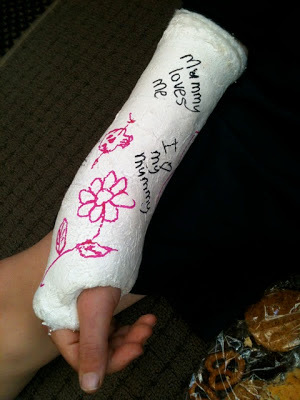 We thought the plaster cast would come off today and be replaced by another lighter one like he had on last week, so I liberally decorated this one in the most ridiculous way - on the other side is a big heart with "Mum Rulz" boldly displayed. Too bad that we found out when we met with the surgeon that although the procedure had been successful (x-rays today confirmed that the dislocated bone has remained in position), there was no way they would be touching this cast, in case anything moved. Ha ha...Caleb's stuck with it this way. I was glad that I hadn't been present in the theatre last Friday, or even anywhere near the glass doors, when the doc explained what they had needed to do - ten minutes of hard pulling just to get the muscles to loosen up sounded bad enough. Very relieved that all seems well though, and now we just wait a few weeks for the bones to knit.